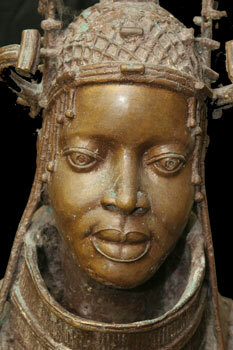 Many people (regardless of race), have inculcated a fear of the Mask Tradition of Tribal Africa. There are many reasons for this, but one of the most simplistic, and sinister is the mistaken belief that all Tribal African masks and statuary are possessed by spirits. Fortunately, nothing could be further from the truth, and should not be a detraction to Collecting African Tribal Art. The Mumuye carve very stylistic statues called “iagalagana”. These statues portray a figure within an imaginary cylinder, hence the shape of the arms in wrapped fashion encircling the body. What is particularly fascinating is the use of space, and the representation of the surfaces in the elbow region. The historical western spiel is that the statues themselves represent “tutelary” spirits. Yet the argument can be made that this may be the “western” perspective of a very innocent, cultural, and complex relation. A tutelary spirit need not be a separate entity, a demon, or a ghoul from hell. 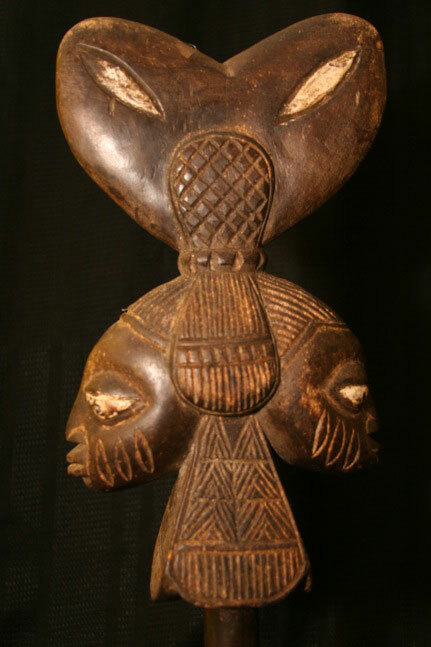 This is not part of Tribal Africa, nor is it common among peoples who practice animism. A spirit may simply reflect what is in the observer, and also what one perceives by the actions, shape, or form of the observed. With such a view one can see a tree being described as having an aged spirit, or a gentle, peaceful spirit, or life force. The “iagalagana” seem to have been carved to represent the “spirit” of the trees. They are therefore abstractions of an esoteric dimension captured in shapes that are themselves abstractions of the human form. This thinking presents a certain harmonic composition which makes a fair cultural fit. It would seem a stretch that a carver could himself carve a spirit or develop a home for a spirit without some intermediary religious activity. The characteristic markings on the “Iagalagana” are simply representative of the Mumuye tradition and culture. Finally one may look to the Gospel According to Thomas – an early Christian document, found in Egypt, in December 1945. 77 Jesus said, “I am the light that is over all things. I am all: from me all came forth, and to me all attained.